The RL 521/23 shutter / blind actuator is a KNX device with two channels. The device is installed in an AP 118 Control Module Box or an AP 641 room control box. The bus is connected via a bus terminal block. The actuator electronics are supplied via the bus voltage. The RL 521/23 may be used to control blinds, shutters, awnings windows, or doors. 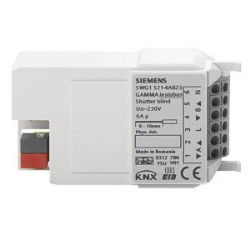 The device is designed to drive (per channel) one AC 230V drive (motor) with electromechanical limit switches or with int electronics for disconnection at the limit positions. For drives with electromechanical limit switches the actuator can be configured to detect the status of the electromechanical limit switches such that the travel time between the end positions can be measured via a synchronization run. The travel time of the blind (shutter is automatically measured from the upper end position to the lower end position and vice versa. The measurement is only reliable for drives with electromecha limit switches. The travel time cannot be automatically adjusted for drives with integrated electronics for disconnection at the limit positions. These drives have to be controlled via a time limit. Their travel times have to be manually measured as precisely as possible and configured in the application program. Parallel operation of several drives on one channel requires the intermediate switching of a special separation relay. If such a separation relay is connected to the output to drive several drives in parallel, then the travel time has to be configured manually. If the device is configured for automatic detection of the travel time, then parallel operation of several drives with electromechanical limit switches or mixed operation with drives with integrated electronics for disconnection at the limit positions is not permitted. The device can detect if the blind / shutter is in the upper or lower end position. This detection depends on the solar protection drive (motor) itself and on the wiring and specifically cannot be guaranteed for drives with integrated electronics for disconnection at the limit positions. Hence, the detection can be disabled by a parameter. If automatic detection of end positions is enabled, the travel time is set to the maximum value after a download of the configuration. If the end positions were detected successfully and the solar protection moved without interruption from the lower position to the upper position, then the parameter value for the travel time is updated and saved. The same ap plies to the travel time from the upper to the lower end position. After a download of the application program respectively of addresses and parameters the solar protection mu st be synchronized. This is triggered when a telegram “solar protection up/down” or “central up/down” is received. The solar protection then performs a synchronization run. First it briefly moves down, then fully into the upper end position. Then it moves from the upper end position to the lower end position measuring the associated travel time. Finally, it moves from the lower end position to the upper end position measuring the associated travel time. After this procedure the solar protection is synchronized and remains in the upper end position until a motion is triggered by another telegram. If the actuator does not detect the upper end position at the start of the synchronization run, then the measurement travels are not executed. In that case, the a ctuator is not synchronized. The synchronization run has to be initiated again as described above.